This list of actors with Hollywood Walk of Fame motion picture stars includes all actors who have been inducted into the Hollywood Walk of Fame in the category of motion pictures. This list does not include any non-acting professionals with motion picture stars, nor does it include any directors or producers with acting credits that are minor when compared to their directing and producing credits. This list also excludes all actors with television or live theatre stars on the Walk of Fame, as well as all animal actors and fictional characters. The star locations and the years of the induction ceremonies are available on the official Hollywood Walk of Fame website maintained by the Hollywood Chamber of Commerce. The years of birth and death are available in the biographical articles on the Los Angeles Times Hollywood Star Walk website, with more accurate birth years from government records—such as birth certificates, census and military records—for some actors via their Wikipedia article sources. A total of 897 actors appear in the list—492 males and 405 females. There are 174 Academy Award winners for acting in the list—88 males and 86 females—and 173 non-winning nominees—95 males and 78 females. There are 550 actors with no Academy Award nominations for acting in the list—309 males and 241 females. The youngest living male in the list is Daniel Radcliffe while the youngest living female is Scarlett Johansson. The oldest living female is Olivia de Havilland and the oldest living male is Kirk Douglas. The youngest at induction is Patty McCormack at 15 years of age, while Bobby Driscoll was the youngest male actor, inducted at 23 years of age. The oldest at induction were Yakima Canutt, Gloria Stuart, and Gina Lollobrigida, all at 90 years of age. The average age at induction is about 54, with males averaging about 57 and females averaging about 51. Posthumously-awarded stars are not included in the average calculations. 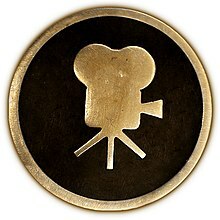 Since the initial star installations of 1958–60 when 660 film actors received stars—165 being posthumously inducted—there have been 15 additional posthumous stars awarded to film actors: Paul Robeson in 1978, Dorothy Dandridge in 1983, Philip Ahn and Eleanor Powell in 1984, Smiley Burnette and Steve McQueen in 1986, Natalie Wood in 1987, Bruce Lee in 1993, Cleavon Little and George McFarland in 1994, John Belushi in 2004, Chris Farley in 2005, Pedro Gonzalez Gonzalez in 2008, Richard Burton in 2013, and Toshiro Mifune in 2016. As of 2019[update], more than 2,600 stars are on the Hollywood Walk of Fame among all five categories: motion pictures, television, recording, radio and live performance. Stars for motion picture actors comprise about one third of all Walk of Fame stars. four actors—Alice Calhoun, Patty McCormack, Henry O'Neill and Helen Twelvetrees—have no induction year specified on the official site, while Joyce Compton is missing a profile page on the official website, though she appears on the Los Angeles Times website; in all those cases, the year is presumed to be 1960 which was the year of the initial placement of 1,558 stars. only acting awards are considered in this list; Academy Award information is available on the official Academy of Motion Picture Arts and Sciences database website via dynamically-generated lists. to see all the actors sorted from youngest to oldest, click the Age column heading once; click again to reverse the order. ^ "Walk of Fame Star Search - Search Results for 'type = motion-pictures'". walkoffame.com. Hollywood Chamber of Commerce. n.d. Archived from the original on May 8, 2017. Retrieved April 26, 2017. ^ "Los Angeles Times Hollywood Star Walk". latimes.com. Los Angeles Times. n.d. Archived from the original on May 8, 2017. Retrieved April 26, 2017. ^ "Walk of Fame Stars: Alice Calhoun". walkoffame.com. Hollywood Chamber of Commerce. n.d. Archived from the original on May 8, 2017. Retrieved May 7, 2017. ^ "Walk of Fame Stars: Patty McCormack". walkoffame.com. Hollywood Chamber of Commerce. n.d. Archived from the original on May 8, 2017. Retrieved May 7, 2017. ^ "Walk of Fame Stars: Henry O'Neill". walkoffame.com. Hollywood Chamber of Commerce. n.d. Archived from the original on May 8, 2017. Retrieved May 7, 2017. ^ "Walk of Fame Stars: Helen Twelvetrees". walkoffame.com. Hollywood Chamber of Commerce. n.d. Archived from the original on May 8, 2017. Retrieved May 7, 2017. ^ "Walk of Fame Star Search: Search Results for 'Joyce Compton'". walkoffame.com. Hollywood Chamber of Commerce. n.d. Archived from the original on May 8, 2017. Retrieved May 7, 2017. ^ "Hollywood Star Walk: Joyce Compton". projects.latimes.com. Los Angeles Times. n.d. Archived from the original on May 8, 2017. Retrieved May 7, 2017. ^ "History of the Walk of Fame". walkoffame.com. Hollywood Chamber of Commerce. n.d. Archived from the original on May 8, 2017. Retrieved April 26, 2017. ^ "The Official Academy Awards® Database". awardsdatabase.oscars.org. Academy of Motion Picture Arts and Sciences. n.d. Retrieved April 26, 2017. This page is based on the Wikipedia article List of actors with Hollywood Walk of Fame motion picture stars; it is used under the Creative Commons Attribution-ShareAlike 3.0 Unported License (CC-BY-SA). You may redistribute it, verbatim or modified, providing that you comply with the terms of the CC-BY-SA.